New Orleans Pelicans power forward Anthony Davis (23) talks with a referee during the second half of the game against the Indiana Pacers at Bankers Life Fieldhouse. Indiana Pacers beat New Orleans Pelicans 99 to 82. Trailing after the first half, the Pacers fell back on what they do best, upping the defensive pressure to frustrate the Pelicans and pull out the victory. Paul George scored 24 points and grabbed 10 rebounds to lead four Pacers in double figures and Indiana rallied from a seven-point, second-quarter deficit for a 99-82 win over New Orleans on Saturday night. George said the Pacers had to get after Eric Gordon after the former Indiana University star repeatedly drove the lane in the first half to score 17 of his 21 points. "He’s a tough matchup," the 6-foot-9 George said of the 6-4 Gordon. "He’s so quick. He has a great center of gravity. He has great second and third moves. "I did what I do: use my length and crowd him." George said the Pacers knew they had to defend better after New Orleans shot 52.5 percent (21 of 40) in the first half. Despite getting good looks, the Pacers shot 41.9 percent (18 of 43) before intermission. "We knew eventually that the shots we were going to fall," George said. "We just play so well defensively, we know that’s going to keep us in the game. We just stuck to our defense." Lance Stephenson scored 19 points on 8-of-12 shooting, Danny Granger came off the bench to score a season-high 13 and George Hill added 10 for Indiana. 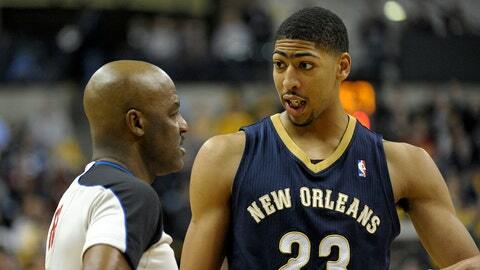 Alexis Ajinca scored a season-high 17 points, reserve Tyreke Evans added 12 and Anthony Davis 10 for New Orleans. Pelicans’ shooting forward Ryan Anderson remained in a Boston hospital after sustaining a cervical stinger when he collided with the Celtics’ Gerald Wallace and fell hard to the floor Friday night. Five different Pacers scored as Indiana went on a 14-0 run over a 4:12 span of the third quarter. The Pelicans, meanwhile, missed seven straight field goals. The frustrated Pelicans also drew three technical fouls during the Pacers’ third-quarter run — one each to Davis, Jrue Holiday and assistant coach Dave Hanners — the last two after a foul call on Holiday. Gordon scored just two points in the third quarter. Ajinca converted both of his field goals in the period, but the rest of the Pelicans missed 12 of 14 attempts. "We just didn’t play that well," Pelicans’ coach Monty Williams said. "Basically, they took it to us on the defensive end, and I thought offensively Stephenson was the catalyst for them. "We just got out of sync on the offensive end, and that led to them getting a number of offensive opportunities. They just picked up, and we did not." Indiana made 11 of 16 field goals (68.8) in the decisive quarter. "They came out and played a great first quarter, and we buckled down the rest of the way," said Pacers’ coach Frank Vogel. "We wanted to mix up the matchup on Gordon, give him a different look. "We adjusted our offensive package a little bit to get more efficiency. What we showed in the third quarter is who we are: we’re a high-powered offense with some shot-makers." The Pelicans put together a 12-0 run over a 3:08 span in the first quarter to push a two-point lead to a 27-13 advantage 2:30 before the break. Davis hit a jumper and drove the baseline to pace the surge. Watson hit a 15-foot jumper, Luis Scola sank a jumper from the right side and Watson made a 19-footer as Indiana responded with a 6-0 burst in under a minute early in the second period to close to within eight points. Gordon scored his 17 first-half points on 7-of-11 shooting, including 3 of 4 from beyond the arc as the Pelicans led 49-44 at the half. NOTES: Earlier Saturday, the Pacers recalled rookie forward Solomon Hill from the Fort Wayne Mad Ants of the NBA D-League. He averaged 19 points and 3.5 rebounds in two games there. . The Pacers’ comeback went against the Pelicans’ grain. Going into Saturday’s game, New Orleans had been 9-1 when holding its opponent to fewer than 100 points and 11-5 when it had the halftime lead. . George has scored more than 20 points in 24 of the Pacers’ 32 games. … The Bankers Life Fieldhouse crowd rose for a standing ovation when the score of the Colts’ 45-44 comeback win over Kansas City at nearby Lucas Oil Stadium was announced at the half. "I’m really happy for Indy sports fans," Vogel said. "A clean sweep tonight."